The content of this article provides interesting history, facts and information about Gladiators at the Colosseum. Gladiators who fought at the Colosseum were enlisted from slaves captured as prisoners of war. Gladiators fought against each other, wild animals and condemned criminals, sometimes to the death, for the entertainment of spectators. Gladiators were designated a particular fighting style which suited their physique and were trained with the relevant armor and weapons. There were strict rules and protocol surrounding the fights of gladiators at the Roman Colosseum. A gladiatorial fight involved a matched pair. Gladiators were always clothed to resemble barbarians conquered by the Romans. They were armed with unusual and exotic weapons and their fights depicted famous victories which illustrated the power of the Roman Empire. Gladiators at the Colosseum - "We who are about to die, salute you!" After the entry of the gladiators at the Colosseum they would have saluted the emperor shouting the ritual chorus of "Ave imperato morituri te salutant!" which meant "We who are about to die, salute you!" 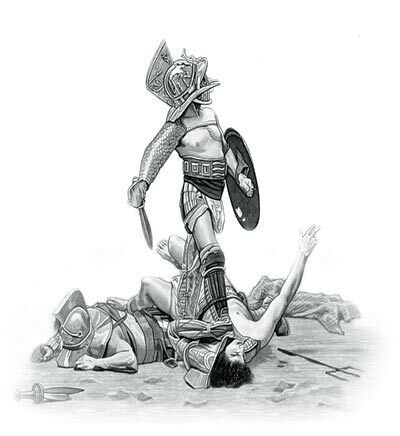 Gladiators were expected to fight to the death, or at least demonstrate that they were willing to die. The gladiators who fought in the Colosseum and other Roman arenas had sworn a legal agreement by which they handed themselves over as slaves to their master and trainer, agreeing to submit to beating, burning, and death by the sword if they did not perform as required. Gladiators at the Colosseum who acknowledged defeat could request the fight to be stopped. The gladiator would signal his request by raising his finger, or his hand and arm. The editor took the crowd's response into consideration in deciding whether to let the loser live or order the victor to kill him. This was referred to as the Pollice verso meaning "With thumb turned." It is not clear which way the thumb was turned to signify life or death although it is commonly believed that the Thumbs up signalled life and the Thumbs down signalled life. The content of this Gladiators at the Colosseum category on life in Ancient Rome provides free educational details, facts and information for reference and research for schools, colleges and homework. Refer to the Colosseum Sitemap for a comprehensive search on interesting different categories containing the history, facts and information about Ancient Rome. Just like the subject of Gladiators at the Colosseum there is hardly a page of Roman history and the Romans that is not, on some way, connected to the Roman Colosseum which became a symbol of Rome, its society, culture and life.